The intraerythrocytic malaria parasite is under constant oxidative stress originating both from endogenous and exogenous processes. The parasite is endowed with a complete network of enzymes and proteins that protect it from those threats, but also uses redox activities to regulate enzyme activities. In the present analysis, the transcription of the genes coding for the antioxidant defense elements are viewed in the time-frame of the intraerythrocytic cycle. Time-dependent transcription data were taken from the transcriptome of the human malaria parasite Plasmodium falciparum. Whereas for several processes the transcription of the many participating genes is coordinated, in the present case there are some outstanding deviations where gene products that utilize glutathione or thioredoxin are transcribed before the genes coding for elements that control the levels of those substrates are transcribed. Such insights may hint to novel, non-classical pathways that necessitate further investigations. The Plasmodium-infected erythrocyte is under constant oxidative stress. This is caused by exogenous reactive oxidant species (ROS) and reactive nitrogen species (RNS) produced by the immune system of the host, and by endogenous production of ROS generated during the digestion of host cell haemoglobin and concomitant biochemical reactions. Small amounts of ROS can also be produced by the mitochondrial electron transport and by various metabolic processes. The biochemistry and molecular biology of antioxidant defense-related enzymes and intermediates, shown schematically in Fig. 1, have been extensively discussed in recent reviews [1–5]. The entire battery of antioxidant enzymes and their substrates must be functionally present when the parasite starts the digestion of host cell haemoglobin and when the immune system starts to be challenged by parasite antigens. These events start to happen at the late ring-early trophozoite stage when the parasite engages in intensive digestion of the host cell haemoglobin and the surface of the erythrocyte is sufficiently altered to be recognized by the reticuloendothelial system as 'non-self'. 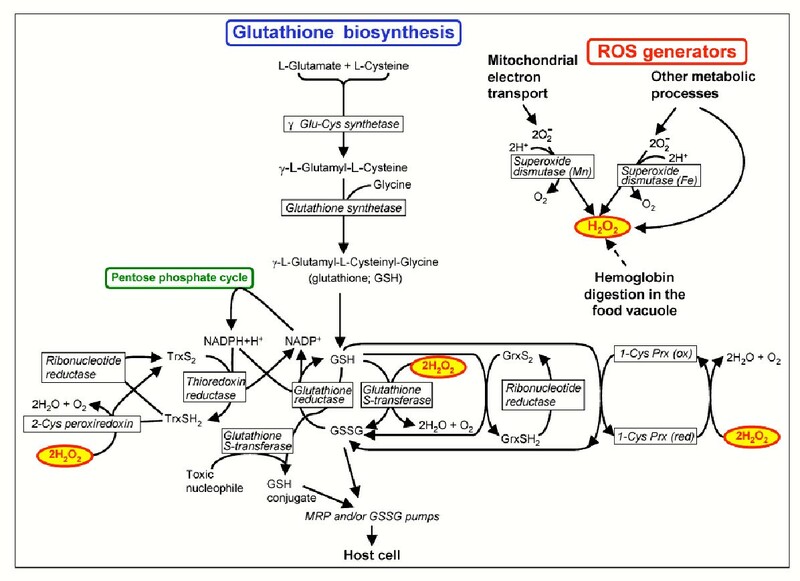 Some ROS may escape the antioxidant defense of the parasite and reach the host erythrocyte where they are handled by catalase and glutathione peroxidase. However, even this defense system is not fully effective since the fingerprints of oxidative stress are discernable in the membrane of the infected red blood cells (RBC) such as clustering of band 3  and increased levels of lipid peroxides . It is not intended to review in depth the redox metabolism of the plasmodium-infected red blood cell (IRBC), as several recent reviews are available. Rather, the stage-dependent transcription of genes that code for enzymes and proteins that are involved in the antioxidant defense of the IRBC will be analysed in a functional context. A general scheme showing the various biochemical processes of antioxidant defense. TrxS2 and TrxSH2 are oxidized and reduced thioredoxin, respectively. GrxS2 and GrxSH2 are oxidized and reduced glutaredoxin, respectively. The expression data used in this study was obtained from the DeRisi transcriptome database http://malaria.ucsf.edu/ of the Plasmodium falciparum intraerythrocytic developmental cycle as described . This database contains the relative mRNA abundance for every hour of the intraerythrocytic cycle of parasite development based on the 70-mer oligonucleotide microarray . The expression profiles of each transcript is represented by an array of ratios between the mRNA level in the time point sample versus a fixed mRNA level in the control RNA pool. Loess-smoothed expression profiles used in this study were calculated as described (see ). Each expression profile was subsequently normalized to its peak value. It is assumed that for each metabolic pathway there is a stoichiometric relationship among the expression levels of the individual enzymes and, therefore, the normalized values are more meaningful for functional evaluation. Loess-smoothed data were used. All enzymes and proteins discussed in this essay with their gene ID's are shown in Table 1. Enzymes and proteins involved in redox metabolism and their gene/locus in the P. falciparum genome. This analysis relates exclusively to the intraerythrocytic phase of the parasite's life cycle. It should be underscored that some of the functions assigned to the respective gene products are putative and have not been verified by biochemical analyses. Such are the cases of thioredoxin-like proteins (MAL13P1.225, PFI0790w, PFI1250w), glutaredoxin-like proteins (MAL6P1.72, PFC0205c), peroxiredoxin (MAL7P1.159), protein disulfide isomerases. The data that was analysed here are expression levels of mRNA. This is a long way from what one ideally would like: expression levels of the functional proteins. The functional meaning of transcription analysis is useful but it does not tell the complete story of gene expression. Functions are performed by proteins and as long as their stability and life span are not known, it may be possible to imply the onset of expression but not its termination. Hence, a short-lived transcription may be less informative than a longer-lived one because the latter indicates that the protein is expressed at least for this duration of time. Nevertheless, when transcription is evaluated by considering a set of biochemically inter-related enzymes and proteins, some information about their coordinated expression may be gained. In what follows, the different elements of the redox metabolism of the parasite will be discussed in functional "clusters", in order to obtain a methodological overview. We start our analysis with superoxide dismutase, a major producer of H2O2 in cells. Then the enzymes involved in the biosynthesis and recycling of glutathione will be discussed, followed by those that utilize glutathione. The thioredoxin system is also discussed in a similar order. Intraerythrocytic malaria parasites ingest and digest the cytosol of their host cell which consists mostly of haemoglobin. Superoxide (O2-) is normally produced when oxidized haemoglobin is exposed to the acid environment of the food vacuole, and can therefore be considered as the major generator of ROS. It is generally supposed that O2- is dismutated spontaneously to H2O2 due to the high local H+ concentration, and that the highly permeable peroxide diffuses out of the digesting organelle to be handled by the antioxidant machinery. One cannot however exclude some efflux of O2- from the food vacuole to the parasite's cytosol. Additional amounts of O2- can be produced by the mitochondrion's electron transport, and possibly other, as yet undefined, processes. But not less importantly, O2- can be produced by the reticuloendothelial system. Phagocytes produce large quantities of O2- through the enzyme NADPH oxidase for use in oxygen-dependent killing mechanisms, and this occurs in malarial infections. Exogenous O2- or H2O2 are most likely dealt with the host cell Cu, Zn-SOD (that produce H2O2) and by catalase which reduces the peroxide to water and molecular oxygen. 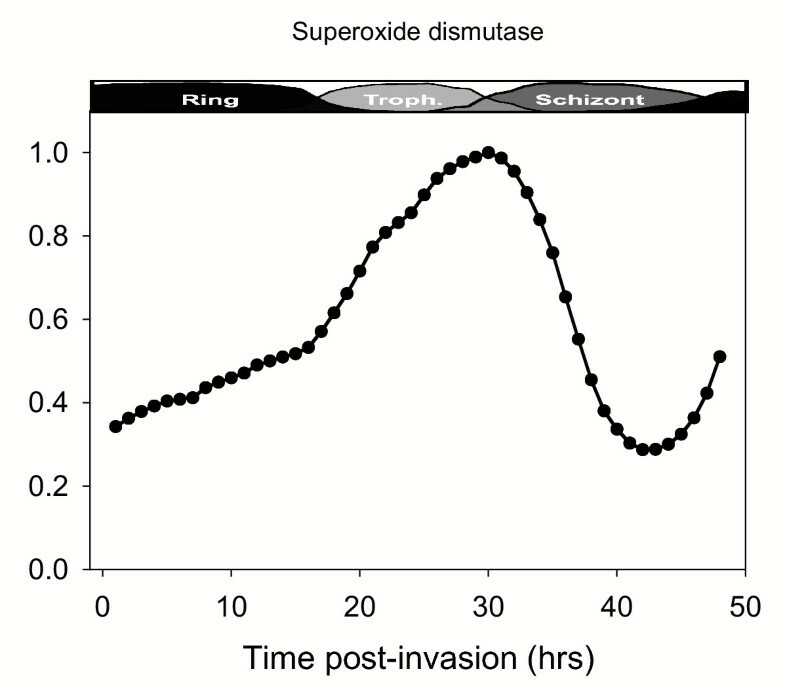 Inside the parasite, regardless of its origin, O2- is dismutated by superoxide dismutase (EC: 1.15.1.1; SOD) to H2O2. Two genes coding for iron-containing SODs have been identified in the P. falciparum genome and both are also very similar to the manganese-containing SOD that is typically mitochondrial. Biochemical analysis suggests that the gene product of PF08_0071 (see Table 1 throughout for the fuller description of these genes and their products) is a typical Fe-SOD , but it is not unlikely that the product of MAL6P1.194 is indeed an Mn-SOD acting inside the mitochondrion. From Fig. 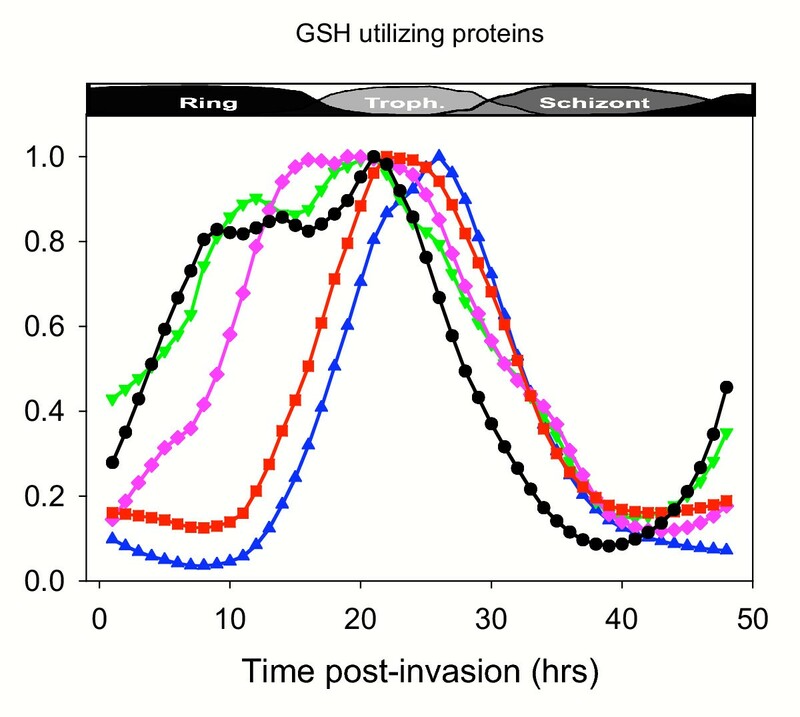 2 it can be seen that the transcription of this gene peaks at 30 hrs post invasion (HPI), at the trophozoite stage. The processes producing O2- in the parasite and their stage dependence are not yet completely known, but the parasite appears to be well equipped to deal with O2- that may be generated by the macrophages at the time of their maximal recognition of infected cells . O2- and H2O2 are also generated by the endoplasmic reticulum-resident oxidoreductin (see below). In addition to dismutated O2-, H2O2 can also be generated directly by some metabolic processes, such as the production of pyridoxal phosphate (peaking at 18 HPI) or the action of dihydroorotate oxidase (peaking at 20 HPI). The parasite deals with this initial threat by means of the glutathione and the thioredoxin (Trx) systems that compose the cellular antioxidant defenses of both the parasite (see below) and the host cell compartment if and when the peroxide reaches it. Glutathione is an abundant tripeptide that in most types of cells is the major element of antioxidant defense. The essential counterpart elements are glutathione peroxidase that reduces both hydrogen and lipid peroxides, glutathione S-transferase that conjugates electrophiles to reduced glutathione (GSH) and some active membrane pumps that can extrude oxidized glutathione (glutathione disulfide; GSSG) or GSH conjugates. P. falciparum is capable of de novo synthesis of glutathione and of its recycling [12, 13]. The two enzymes that mediate the de novo synthesis of glutathione (see Fig. 3), namely, γ-glutamyl-L-cysteine synthetase (EC: 6.3.2.2; γ-GCS) and glutathione synthase (EC: 6.3.2.3; GS) have been cloned [14, 15], gene structure has been analysed, and the biochemical features of GS have been characterized. GSH serves as a substrate for a number of reducing processes such as those mediated by glutaredoxin, 1-cys peroxiredoxin (but see below for indications that it uses mostly thioredoxin (Trx)) and glutathione S-transferase (see below) with the resulting formation of GSSG. The latter is reduced back to GSH by glutathione reductase (EC: 1.8.1.7; GR), using NADPH that is regenerated by the pentose phosphate pathway (see Fig. 1). The genes of the two enzymes that reduce NADP to NADPH are constitutively transcribed throughout the cycle. P. falciparum GR has been cloned [16, 17] and the recombinant protein as well as the enzyme purified from malarial parasites have been characterized in detail. It was shown by Northern blot analysis that the GR-coding gene it transcribed in a stage-specific manner: only weakly in ring, early trophozoite, and segmenter stages, while major transcription occurs in the late trophozoite/early schizont stage. This pattern is very similar to that obtained in the present analysis (Fig. 3). As shown in Fig. 3, the genes for the enzymes responsible for glutathione synthesis and recycling are transcribed sequentially in the order of their functional action. If the level and the timing of transcription determine the level and the timing of translated product, then the maximal production of glutathione is reached at 20 HPI. Mammalian cells are capable of transporting GSSG, glutathione conjugates and GSH as such in the presence of drugs and hence this transport can affect the cellular level of GSH. This is accomplished by the so-called multidrug resistance pumps (MRP's) . Two genes putatively coding for such pumps have been identified in the falciparum genome and their functioning can perhaps be inferred from the ability of the free parasite and the IRBC to release GSH/GSSG to the extracellular medium [12, 13, 20]. 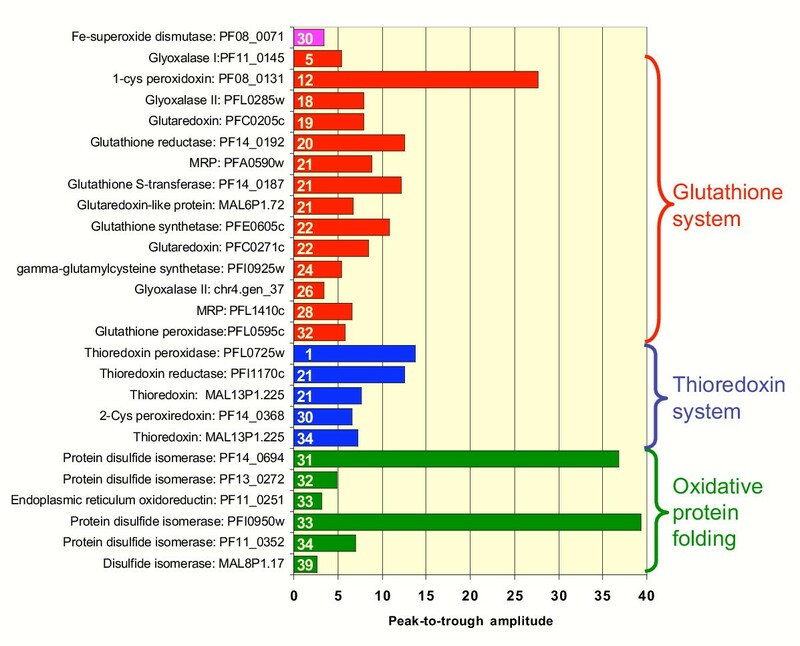 The transcription of one of these MRP-coding genes (PFA0590w) peaks (Fig 3) to coincide with the peak of glutathione synthase, as would be expected from their functional interaction. However, the second MRP gene (PFL1410c) is transcribed much earlier, mostly during the ring stage and peaks again towards the end of the cycle. What does it pump if the de novo biosynthesis of GSH is not yet functional? As shown below, other GSH-utilizing enzymes experience the same apparent deficit. Is it possible that the second pump is working in reverse, i.e., pumping GSH from the host cell into the parasite? This "provoking" suggestion is amenable for experimental testing. It might be expected that genes coding enzymes that utilize GSH will be transcribed after those that synthesize and recycle it. This is indeed the case for most components, but there are exceptions that require alternative interpretations. In most eukaryote cells the reduction of H2O2 and lipid peroxides at the expense of reduced glutathione (GSH) is mediated by glutathione peroxidase (EC: 1.11.1.9; GPx). However, biochemical characterization of the parasite's recombinant protein indicates that this enzyme has an overwhelming preference for Trx over GSH . Hence, the purported GPx gene is actually coding for a Trx peroxidase and the reduction of H2O2 and lipid peroxides is done by other means. GPx must therefore be classified within the Trx system as is discussed below. A recombinant parasite glutathione-S-transferase (EC: 2.5.1.18; GST) has been produced and shown to reduce cumene-hydroperoxide but not lipid-hydroperoxide. GST, thus, compensates partially for the absence of a genuine GPx. Significantly, the GST-coding gene is transcribed during most of the parasite's intra-eryhtrocytic life cycle. Although the major role of this enzyme is to conjugate GSH to various toxic substances, preparing them for export, a small percentage of its activity entails peroxidative action. One wonders about the source of GSH needed for these activities during the early stages, before the peaking of GSH synthesis and recycling. Peroxiredoxins (Prx) comprise a group of antioxidant enzymes having peroxidase activity capable of reducing H2O2 and organic hydroperoxides. Unlike other peroxidases, their enzymatic activity does not entail metals or prosthetic groups as cofactors. Peroxidation of both H2O2 and organic hydroperoxides is performed by 1-cys peroxiredoxin which accepts GSH as a reducing agent . However, Trx-dependency of a 92 % identical protein has been shown . The transcription of the gene peaks at 26 HPI (Fig. 4), following full activation of the GSH synthesis and recycling machinery and coinciding with the peak of endogenous ROS production. Other GSH-utilizing mechanisms operate in the parasite. Most notably are functions catalyzed by glutaredoxins. Glutaredoxin has vicinal thiols in the active site enabling it to catalyse glutathione-disulfide oxidoreductions such as the reduction of ribonucleotide reductase as well as the direct reduction of H2O2. Glutaredoxins are generally reduced by glutathione, but Trx can serve as an alternative substrate. One gene coding for glutaredoxin (PFC0271c) and two genes coding for glutaredoxin-like proteins (the exact function is unknown) have been found in the genome of P. falciparum. As shown in Fig. 4 the glutaredoxin-coding gene is transcribed maximally between 19 and 28 HPI, thus coinciding with the transcription of its putative substrate ribonucleotide reductase (maximal transcription 31–33 HPI) suggesting that glutaredoxin is the major reducer of this enzyme. On the other hand, glutaredoxin-like proteins do not possess the classical conserved active site motif of glutaredoxins, they have only 1-Cys residue, and are not active in the general glutaredoxin assay . More than 200 mammalian proteins with reactive sulfhydryl sites have been identified in recent years as candidates for coordinate redox control of diverse cell functions . The state of sulfhydryl oxidation is maintained by thioredoxins, glutaredoxins, and glutathione . Outstanding among these proteins are proteases that are activated by reduction and inhibited by oxidation. The possible comparable regulation of the activity of falcipains has not been investigated heretofore. Such regulation is underscored by the recent demonstration that falcipains are not restricted to haemoglobin digestion , but are also involved in invasion  and rupture of the mature schizont , The present analysis establishes the time-scale of such possible regulation. Genes coding for two other enzymes that involve the utilization or the generation of GSH have been identified in the genome of P. falciparum: lactoylglutathione lyase (EC: 4.4.1.5; glyoxalase I) and hydoxyacylglutathione hydrolase (EC: 3.1.2.6; glyoxalase II) and their biochemical functions have been revealed . These enzymes participate in a metabolic pathway that catalyses the detoxification of α-oxoaldehydes to the corresponding aldonic acids, using catalytic amount of GSH as cofactor. α-Oxoaldehydes react with guanyl residues in DNA and RNA, and with cysteine, lysine and arginine residues in proteins. The modification of DNA induces mutagenesis and apoptosis. The modification of proteins leads to protein degradation and activation of a cytokine-mediated immune response . A possible substrate of the glyoxalase system in the parasite is the glycolytic intermediate dihydroxyacetone phosphate that forms spontaneously the toxic electrophile methylglyoxal, an α-oxoaldehyde. Although this detoxification system seems essential to the parasite (about 10 % of the lactate produced in P. falciparum is D-lactate, the final product of the glyoxalase pathway) it needs only catalytic amounts of GSH that is essentially recycled by the system itself. Glyoxalase I has been recently cloned, expressed and its biochemical properties have been characterized . The transcripts of glyoxalase I gene peaks at 28 HPI, while those of the two genes coding for glyoxalase II peak at 12 and 25 HPI, suggesting the expression of glyoxalase I determines the onset of the detoxification pathway. 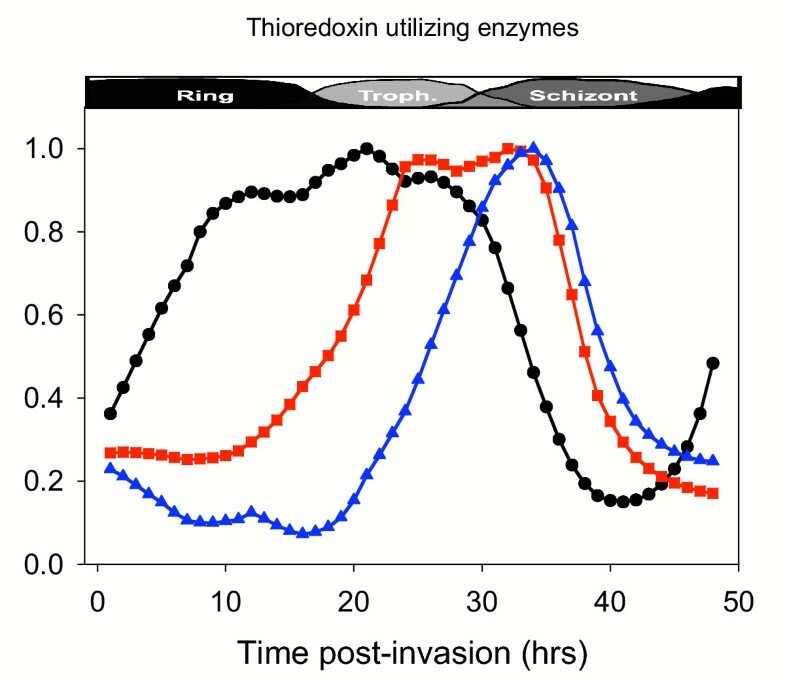 The importance of this pathway to the parasite can be inferred from the inhibitory effect of glyoxalase inhibitors on parasite growth , but the pathway probably draws little on the stores of GSH. Post-translational modification and maturation of proteins in the endoplasmic reticulum involves disulfide formation . This activity is mediated by protein-disulfide isomerases (PDI) and oxidoreductin, both having Trx-like activity. In the oxidizing environment of the endoplasmic reticulum, PDI catalyzes both the oxidation and isomerization of disulfides on nascent polypeptides and simultaneously becomes itself reduced . Four genes coding for PDI are transcribed during the erythrocytic cycle. Their gene ID's and times of maximal transcript level are (data not shown): MAL8P1.17 (31 HPI), PFI0950w (33 HPI), PF11_0352 (32 HPI), PF13_0272 (34 HPI; this gene has not been annotated as PDI, but close inspection of its homology to other genes clearly indicates that it is a PDI) and PF14_0694 (39 HPI). As indicated by one of the reviewers of this report, although these genes were annotated as PDI in PlasmoDB, no evidence indicates they are "true" PDI. Only the translated MAL8P1.17 gene shows the classical organization of PDI. The others contain either one active site (instead of two) and in that case, they could act as weak oxido-reducatses activity but not as isomerases. Alternatively, they have mutated amino acids (Cys->Ser; data not shown) in the active site and in that case, they may act as isomerase but certainly not as oxido-isomerase. The late transcription of the PDI gene may be involved in the maturation of merozoite proteins, such as the EBA-175, that accumulate in the micronemes and characteristically contain conserved cysteine domains  and the rhoptry protein apical membrane antigen 1 (AMA-1)  known for its numerous disulfide bonds. Some of these genes seem to have a transit signal sequence that may suggest their localization to the endoplasmic reticulum. Recently, oxidoreductin (Ero1p) has been identified as a candidate enzyme for the maintenance of redox status in the ER. Oxidoreductin of P. falciparum (PF11_0251) peaks twice, at 6HPI and at 33 HPI). Oxidoreductin, is oxidized by molecular oxygen in an FAD-dependent manner, thereby producing O2-, is an FAD-dependent enzyme. Oxidoreductin subsequently acts as a specific oxidant of reduced PDI, which can then directly oxidize again disulfide bonds in folding proteins. Thus, this activity results in ROS production. GSH can also participate in the reduction of -S-S- bonds in oxidized proteins and thereby be oxidized to GSSG. 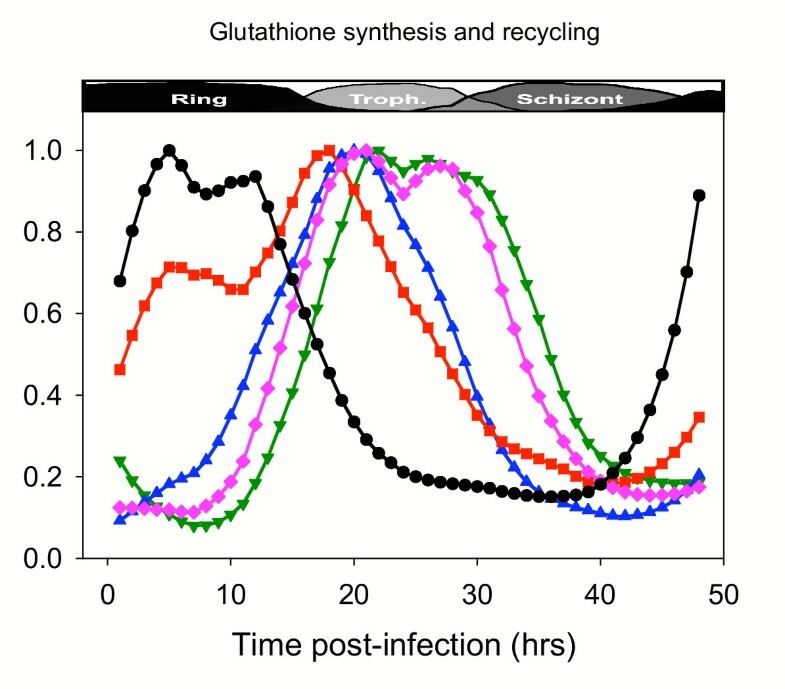 It is not clear how glutathione is transported across the ER membrane, but cells involved in intensive secretion are also known to secrete GSSG. In the plasmodium-infected RBC, the destination of such GSSG is presumably the host cell compartment. The quantitative contribution of these processes to the overall oxidative stress and glutathione metabolism is impossible to evaluate at the present time. TrxR catalyses the reduction of oxidised thioredoxin (Trx-S2) by NADPH using FAD and its redox-active disulphide (steps 1 and 2). 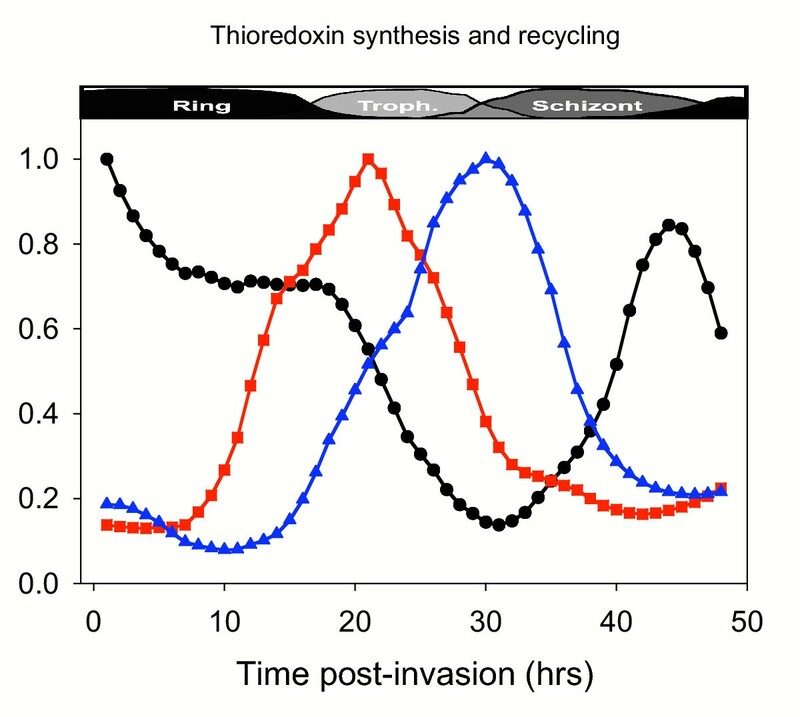 Reduced thioredoxin (TrxR-(SH)2) then directly reduces the disulphide in the substrate protein (step 3). The thioredoxin system of P. falciparum has been characterized . The Trx system supplies reducing equivalents for a wide variety of acceptors, most notably ribonucleotide reductase (only the gene coding for ribonucleoside-diphosphate reductase, EC: 1.17.4.1, is found in the plasmodium genome; maximal transcription 31–33 HPI) and is very efficient in the nonspecific reduction of protein disulfide bonds. The transcription of the various genes of the Trx system is shown in Fig. 5. There are altogether 4 genes coding for Trx (Table 1), but only two are found in the DeRisi transcriptome database. Two genes coding for Trx are transcribed in a sequential mode. The missing genes can be found in the Winzeler laboratory site http://carrier.gnf.org/publications/CellCycle/. The maximal transcription of genes PF14_0545, PFI0790w and of PFI1250w (results for this gene are conflicting; see details in the web site) occurs at the early schizont stage, i.e. when the transcripts of the other two genes are at their minimum. The product of PFC0165w has been recently characterized as unique to P. falciparum and thus named plasmoredoxin . It can be reduced by Trx and glutaredoxin, but only minimally by GSH. Plasmoredoxin can reduce GSSG and ribonucleotide reductase. The transcript of the Trx-coding MAL13P1.225 is already high immediately following invasion (Fig. 5) and remains highly expressed throughout the ring stage. The transcript of the plasmoredoxin-coding gene peaks at 20 HPI. TrxR (EC: 1.8.1.9) peaks considerably later, at 30 HPI, casting a doubt about the efficacy of both products of Trx genes to perform their function in the absence of recycling: oxidized Trx must be reduced by TrxR in order to be able to carry out its functions. Nevertheless, the transcription of the other Trx genes at the early schizont stage (PF14_0545, PFI0790w and PFI1250w; data not shown) is suitably timed with the transcription of TrxR. Reduced Trx is also involved in the action of several peroxidases which may be functioning at this stage. The transcriptions of thioredoxin peroxidase (peaking at 32 HPI), the gene annotated as GSH peroxidase but experimentally shown to utilize Trx (a broad peak between 21 and 32 HPI) are well coordinated with that of TrxR (see Fig. 6). The transcript of the gene coding for 2-cys peroxiredoxin that utilizes Trx as a reducing agent , peaks for more than 20 hours starting at 7 HPI. This is possibly amongst the longest lasting transcripts in the transcriptome of P. falciparum. The importance of 2-cys peroxiredoxin for antioxidant defense is evidenced by the greater sensitivity of the null mutant to superoxide and to nitric oxide . But, although these findings imply that the enzyme protects the parasite from oxidative and nitrosoative stresses, the availability of reduced Trx for these activities before 31 HPI when the TrxR transcript peaks, remains to be established. The analysis of the transcriptome of P. falciparum  has revealed two major parameters that characterize functional clusters of genes, the time of peaking and the amplification of gene transcription (expressed as peak-to-trough amplitude of the expression profile). The amplification was suggested to express the level of transcriptional regulation. An analysis of these parameters done on the genes discussed in the present study is shown in Fig. 7. In general, the amplification of most enzymes and proteins of both the glutathione and the Trx systems resembles that of basic metabolic functions, including glycolysis and nucleotide synthesis (amplification range 5 to 10). Exceeding this range are 1-cys peroxiredoxin (28-fold) and two PDI genes (36- and 39-fold). Similarly high amplifications were almost exclusively found for genes that are involved in the invasion process that is expectedly unique to an intracellular parasite. These considerations suggest that overly amplified transcripts identified in this study are also related to unique processes in the parasite. Amplification of transcripts of the various genes considered in this study. Numbers inside the bars indicate the time of peak transcription post invasion. Bars are arranged in increasing peaking times within each group. Data were taken from http://malaria.ucsf.edu/. In previous functional analyses of the transcriptome of P. falciparum it was contended (and shown) that the parasite has evolved a functionally concerted mode of transcriptional regulation. Thus, functional clusters of genes related to a particular function are transcribed in rational sequence that corresponds to the timing of the physiology and the biochemistry of the intraerythrocytic phase of the parasite life cycle. In-phase co-expression was observed for genes of many general processes such as RNA and DNA synthesis and for parasite-specific processes such as erythrocyte invasion. From the present study, it is clear that both in the glutathione and the thioredoxin systems not all transcriptions are in phase. A detailed analysis of this complex expression pattern reveals rational connections between gene expression and metabolic function of the protein products. For most factors of both studied systems, the expression of users (GSH and Trx users) lags behind that of the producers (de novo synthesis and recycling). However, there are exceptions to this rule, which represent unexpected chains of events in classical biological systems (predators never precede their prey). Such discrepancies point out to possible missing links in the metabolic pathways based on the current status of the gene sequencing and annotations. Alternatively, these could indicate a nonlinear relationship between transcription and translation. Only detailed analysis of the time-dependent levels of protein and of the pertinent low molecular weight substrates/products can solve this apparent paradox and hints to the unresolved meaning of the variable duration of the transcripts: is it related to transcript or to protein stability. We thank Professor W.D. Stein for critical reading of the manuscript and his helpful suggestions. Both authors have equally contributed to this paper.